ZMA stands for Zinc, Magnesium, and aspartate. These key minerals are needed by your body to operate at maximum potential. Deficiencies in these essential minerals are very common and ZMA allows for easy supplementation of these two minerals and Vitamin B6. Zinc – Used by the body for over 100 enzymatic reactions in the body. Zinc is known as an essential mineral, meaning the body needs it to function and without it the human body cannot live. Deficiencies are very common in hard-training individuals. Magnesium – Magnesium is the #1 most important essential dietary mineral that is needed by your body to function and operate at optimal health. Supports healthy energy levels, reduces muscle cramps during workouts, boosts repair, lowers injury rate, and allows your body to function at its very best. If you are deficient in magnesium you are operating at a sub-optimal level. Most people are magnesium deficient and they don’t even know it. Vitamin B-6 – Boosts energy production, fights fatigue, improves focus & mental clarity. Increases absorption and effectiveness of zinc and magnesium. ZMA does not increase testosterone. Those who are lacking zinc could potentially have lower testosterone levels. Zinc can help balance hormones back to normal levels. 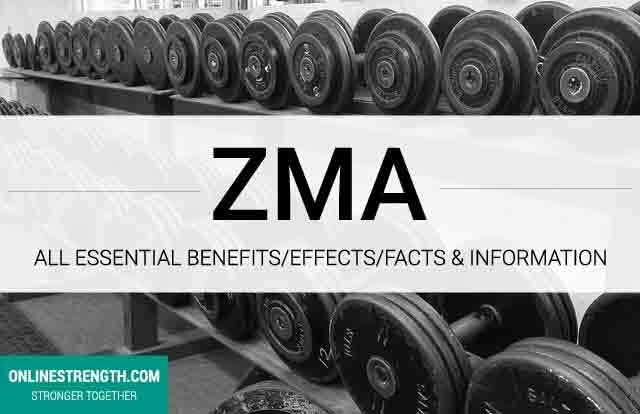 ZMA is useful supplement for people that lack zinc and magnesium. ZMA is Known to help reduce stress, muscle soreness, and increase healing. Improving your ability to recovery faster and more effectively allows you to repair muscle fibers faster which can lead to faster lean muscle gains. A reduction in muscle soreness allows you to function normally after brutal workouts allowing you to train insane without worrying about the aftermath. Reducing stress can help your body relax allowing you to “shut-off” so your body can rest and recovery much easier during the night. The Vitamin B-6 in ZMA is needed by your body for digestibility. Easier digestion allows your body to use the vitamins and minerals more easily. This will help stop any stomach aches or gastrointestinal problems. Increases exercise performance and improves muscle recovery which can lead to more lean muscle gains. Training daily can really put a ton of stress on you and your body. Without proper nutrients and rest your body won’t be able to produce the results you are truly capable of. Poor exercise performance in the gym and slow recovery from sets can hinder your muscle building progression. Supplementation of ZMA is one way you can give your body needs to function at it’s optimal state. To fully maximize the potential of your ZMA supplement do the following. Take it 30 minutes before bed on an empty stomach. ZMAs effect on healing, tissue repair, and muscle growth are exponentially increased during sleep. Do not take ZMA with food. Food can effective the absorption rates of magnesium and zinc. ZMA should be supplemented dail. A lot of the zinc and magnesium is needed by your body for normal functionality and a great deal is lost through sweat and through urine.